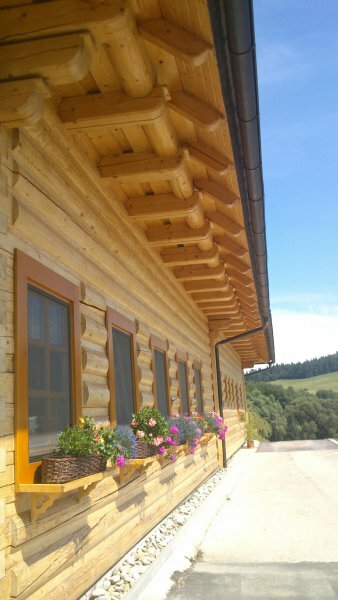 Restaurant and guest house Koliba Papradno is located directly on a farm in the village of Papradno surrounded by a beautiful landscape of mountains and grasslands. Koliba is ideal for family functions, wedding parties or business meetings. The restaurant was built in 2008 and the accommodation part has been completed in 2017. Agropenzion Grunt is located just 1,5 km away from Koliba. June – September: opened daily from 11.00 a.m. till 8.00 p.m.
October – May: opened weekends only from 11.00 a.m. till 8.00 p.m. If you would like to visit us outside our opening hours, please contact us in advance via phone or e-mail. Capacity of guest-house Koliba is 20 beds in two double rooms with double bed and four double rooms with the possibility of two extra bed in each room. Every room has its own TV and a private bathroom. Accommodarion alviable all year round. Our guests can order breakfast, full board, half board or own choice from menu card. There is an outdoor horse-riding arena just in front of the restaurant where you can take a horse riding lesson with a qualified instructor. In summer you can sit out on the terrace with the capacity of 20 seats and open fireplace while your children can play on a spacious outdoor playground. Directly from the Koliba you can go hiking on marked hiking trails. May - Shepherd path – opening ceremony in cooperation with the civic association "Bačova cesta"